Halo 3 tested and working. Extras DVDs have barely been used if at all. A l s o t h e steel b o o k. O r i g i n a l b o x. F a l l o u t 4 P i p b o y. N o g a m e, o r i g i n a l b o x. F a l l o u t 3 L u n c h b o x. N o g a m e s i n c l u d e d. Al l it em s we re f or d is pl ay purposes on ly. Includes halo 3 essentials disks, Game disk, stand, and helmet. Please review pictures to see exactly what is included. Let me know if you have any questions. Thanks for looking. All have been tested and function properly. This is a really cool collectible for any Fallout fan! I ordered 5 and against all odds all of them were blue so passing along the duplicates for cheap. The one shown is the one I'm keeping but the others have not been removed from their plastic so are still new. Legendary Halo 3 Limited Collector's Edition Master Chief Helmet and Stand. Condition is Used. Shipped with USPS Priority Mail. Halo 3 Legendary Edition Master Chief Helmet and Stand ( No Game). Condition is Used. It’s unfortunately missing the mouth piece in front but it’s not too noticeable. Will ship quickly this is a pretty cool helmet. Shipped with USPS Priority Mail. Capcom Mega Man Light Up Wearable 1:1 Scale Blue Helmet Replica Cosplay Rockman. Condition is New. Shipped with USPS First Class Package. Rare space suit and space helmet for Xbox One Fallout 76. Let someone else do the leg work for you! Send gamer tag for fast in game delivery! Note you are paying to meet. I will drop the item for free! Ask any questions. 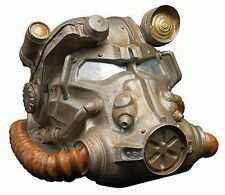 Fallout 76- rare Firebreather uniform Firebreather helmet(Xbox) . Condition is New. You are bidding on a time to meet the gamer. I’ll drop the items for FREE! Ask any questions leave gamertag for quicker delivery. 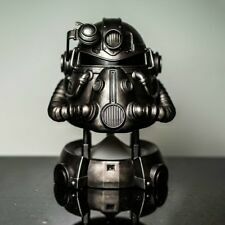 Fallout 76 Power Armor Collector's Edition -. Fallout 76 Power Armor Edition West Tek Bag. Otherwise the item is Used- Very Good Condition! - Item shows very little signs of use. Item has been fully inspected, tested and cleaned! CONDITION: Used. Very nice condition. 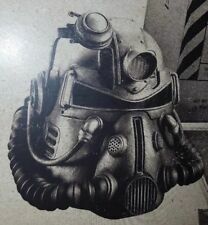 Rare straight jacket and faschnact mask for Xbox One Fallout 76. Let someone else do the leg work for you! Send gamer tag for fast in game delivery! Note you are paying for time to meet. I will drop the item for free! Ask any questions. Killzone 3 Helghast Edition Helmet Figure Only No Game. Condition is Used. Shipped with USPS Priority Mail. New! Mega Man Limited Collector's Edition SDCC Helmet Replica Set. New in the box, never opened! Halo 3 Legendary Edition Master Chief Helmet with Stand (No Game). Has the number 487239 on the back; a finish date of 12/26/2006, HT-0660, P/N 206-2066L-A01 M.R 4 on the bottom. Condition is Used and has minor scratches; overall good condition. I do not have the box nor the game. Please see pictures and ask any questions prior to bidding. HALO 3 LEGENDARY EDITION MASTER CHIEF COLLECTORS HELMET With Stand (No Game). Condition is Used. Has some minor wear. Please refer to pictures & contact me with any questions. Thanks! Shipped with USPS Priority Mail. This would be perfect for a cosplay or on shelf collectible for any Halo fan. It's very reflective so no one can see in but you can easily see out ( like wearing lightly tinted gold sunglasses ) It also has 4 working LED's ( 2 on each side ) that can be turned on and off with a simple push of a button on the side. Halo 3 Legendary Collectors Edition Master Chief Helmet + Stand No Reserve!! Item is in pre-owned condition. Minor nicks, and shelf ware. See pictures for details. Rare skeleton and mask for Xbox One Fallout 76. Let someone else do the leg work for you! Send gamer tag for fast in game delivery! Note you are paying to meet. I will drop the item for free! Ask any questions. Custom made destiny helmets. Celestial NightHawk, One eyed mask, and crown of Tempests. Brand new destiny pins, fanmade! Work together, or not, to survive. Under the threat of nuclear annihilation, you'll experience the largest, most dynamic world ever created in the legendary Fallout universe. Our good friends at Vault-Tec have pulled double shifts, working around the clock to assemble this one-of-a kind compilation.for you! Halo 3 limited collector's legendary edition Masterchief Helmet. Condition is New. Shipped with FedEx Ground or FedEx Home Delivery. Collectible Coin bank for Fallout fans. Great gift for Fallout fans. Fallout 76 T-51 Power Armor Helmet Gesture Control Speaker * Brand New, Unopened. Condition is New. Shipped with USPS Parcel Select Ground.